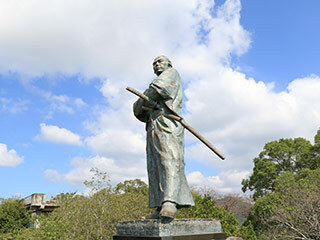 Ryoma Spots Tour (龍馬巡り) is a popular travel in Nagasaki. Sakamoto Ryoma is one of the legends who made a Meiji Restoration and ended Samurai Period. Nagasaki is where he fouund Kameyama Syachu that is the first western style trading company. Ryoma opened his eyes to the world in this place. There are many Ryoma related spots. There is restroom at each spots. 1. use Nagasaki Street Train No.3 to Shindaikumachi. One of the most popular Hero in Japan. Ryoma was born in the end of Edo period, and worked for Meiji restoration. He spent his life to close the Edo Government and open Japan to global world. Kazagashira Park is one of Sakamoto Ryoma spots in Nagasaki. It is located on the top of the hill that is 152m tall and has a great view. Especially, it has a great night view of Nagasaki. There is the Statue of Sakamoto Ryoma because this is the spot where Ryoma opened his vision to the world and made his decide to end the Samurai Era. It is also known as beautiful Sakura and Hydrangea spots. Ryoma's boots is one of Ryoma's spots in Nagasaki. It is 60cm giant boots made for the 130 years anniversary for the establishment of Kameyama Syachu Company in 1995. You can put your feet in this boots with your shoes. Wakamiya Inari Shrine is one of Ryoma Spots located in Nagasaki. It was constructed in 1673 by Wakasugi Kisanta. Current building is constructed in 1896. It is located nearby Kameyama Company. So, Ryoma and his friend worshiped here many times. Kameyama Syachu Museum is one of Ryoma Spots in Nagasaki city. Ryoma is one of the heroes who made the Meiji Restoration. Kameyama Syachu is the first western style trading company found by him. This museum restored the building and displays many Ryoma related items.